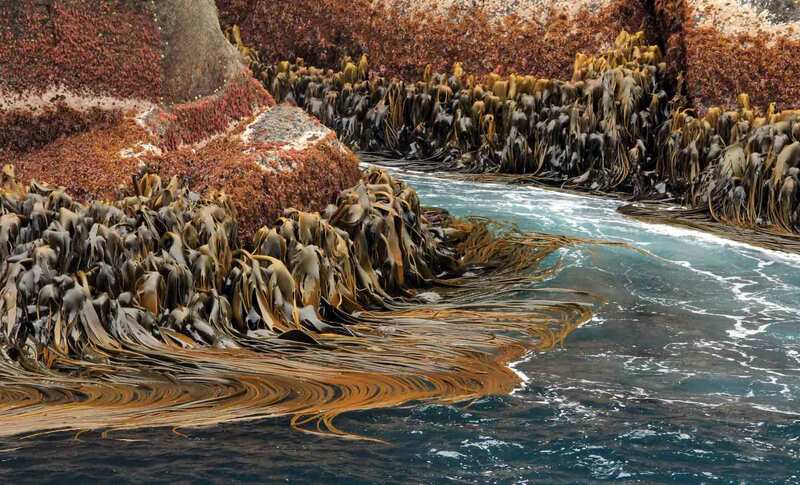 The winner of the 2016 Hilda Canter-Lund photography award is Tiffany Stephens, for her photograph “Swell Life”, showing algae in the intertidal zone of Snares Island, a small sub-Antarctic island, 200 kilometres south of New Zealand. Tiffany took this photograph whilst studying for her PhD at the University of Otago with Chris Hepburn. The picture’s genesis is in the spirit of Henri Cartier-Bresson’s “decisive moment”: Tiffany was on R.V. Polaris II, trying to collect data on the amount of particulate organic matter that was being released into the water by macroalgae, and the role that this played in food webs. One day, when the sea was especially calm and the swell small, the skipper was able to bring the boat closer to the steep rock wall smothered with algae so that she could lower a probe into the water to collect a sample. It was during this manoeuvre that Tiffany was able to snap the picture. Closely cropped, the algae of the intertidal zone and the surging water create a semi-abstract composition that also tells a story of the functioning of near-shore communities in an inhospitable environment. The dominant alga in the photograph is Durvillaea antarctica, “southern bull kelp”, a brown alga that is only found on exposed shores of the cooler regions of the southern hemisphere. Above the Durvillaea there is a resilient band of mixed red and encrusting coralline algae. 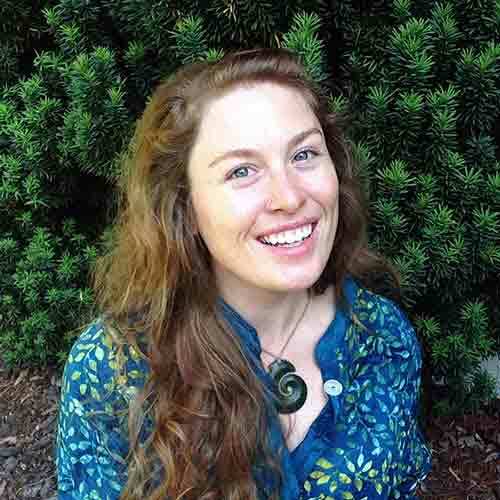 Tiffany Stephens, 2016 Hilda Canter-Lund award winner. Unlike the fucoids, common on north temperate coasts, Durvillaea antarctica does not have air bladders in its fronds. Instead, the interior tissues of the leathery blades have an unusual honeycomb structure which confer strength and buoyancy. This also means that if the holdfast fails, the kelp is able to float, and to be transported around by oceanic currents. This may help to explain why Durvillaea is so widespread in the southern hemisphere. However, it is not just the kelp that benefits: these “rafts” of Durvillaea have been suggested as one means by which the sub-antarctic islands were recolonised by invertebrates following the last ice age. Durvillaea is also eaten by coastal communities in some parts of the southern hemisphere and, bizarrely, used by Maori communities in New Zealand to preserve “mutton bird”, the sooty shearwater (Ardenna griseus). If the honeycomb structure of Durvillaea is to function as a buoyancy aid for the living plant, the exterior tissues of the blades needs to be air-tight. The Maori exploit this property, removing the inner honeycomb tissues to create air-tight bags. They then preserve the young shearwater inside these bags, covered by their own fat (a sort of shearwater confit, I guess?). Left: an underwater view of a “forest” of Durvillaea antarctica; right: the “honeycomb” tissues inside a frond of D. antarctica. Photographs: Chris Hepburn, University of Otago. Fraser, C.I., Nikula, R. & Waters, J.M. (2011). Oceanic rafting by a coastal community. Proceedings of the Royal Society Series B 278: 649-655. Stephens T.A. & Hepburn C.H. (2014). Mass-transfer gradients across kelp beds influence Macrocystis pyrifera growth over small spatial scales. Marine Ecology Progress Series 515: 97–109. This entry was posted in Uncategorized and tagged algae, Durvillaea antarctica, Hilda Canter-Lund, Maori, New Zealand, photography, seaweed. Bookmark the permalink.